It was as always great excitement at the forefront of women’s Categories, and perhaps directed that one could sense a change in the ranks. Ahead of this European Championship it was talked about that several of the profiles should not attend to injuries and various other reasons, priorities. If one thought that this would set back European Championships? One can safely say that the new profiles appear, in the absence of the known.. Many point out that the style of fighting are very different from how men fight, others are more in the direction that the difference is not that big. And on top of that someone point out that to compere you must have the same base. We believe that if there are a difference it would be natural, the base are not the same – regarding to the protection gear (especially leg protection) and in matter of fact that it is natural differences since it is actually about two different genders. So…what is the conclusion? In the introduction, we have scratched a little in what we believe represents a factor when it comes to fighting styles. We know the effect of the lowkicks, and we know how to use them and how we can be hurt of them. In the full-contact styles all over, the lowkicks are included as in K1, Muay Thai, MMA etc. That tells us how effective they are. Even with a little protection we will feel a big difference, and the most of us has been going from children, cadets, youth, novice categories and into the senior categories. From each time we enters a new level, some of the protection gear stays home, and some new door opens up. We are still waiting for the last door to open – women categories senior without leg protection. In the lightweight category under 50 kg, two countries ended at the podium, Poland and Lithuania. Sandra Nowak / Poland, was the only one from lat year`s podium to repeat this, and not only that, she manage to advance from third to second place this year. Violeta Litovska, last year champion went out of the tournament in an early stage. A little surprising during her massive impression last year. Advancing by winning against Karczub Miriam / Hungary , lost her next fight against Erika Zeburtovič / Lithuania, who came in third after loosing against runner up Novak. The fight Zeburtovič vs Litovska was also entertaining, Litovska the strongest the pace was more Zeburtovič. 2-3. The winner of the category, Daiva Kriščiūnienė / Lithuania. Showed strength in the final, getting in on close distance after a little feel out the first 30 seconds. From that moment the fight was capture in the same picture: Daiva Kriščiūnienė pushing forward only using short punches, stalking her opponent, Sandra Nowak backing, circling, up trying to get distance and a more variation in the technical aspect. 3 minutes an a safe victory to Daiva Kriščiūnienė. On her way to the final she had to beat Zhansaya Zinchenko, Georgia, Anastasiia Eismunt, Ukraine and the third place winner Monika Podora / Poland. Light Middleweight category -55 kg, we had at least four European Champions in the line up! Including reign champion Zsófia Szabó / Hungary. -as we all know double EC champion! Non could stop the Hungarians in this category, as Zsófia Szabó was ready for the final so was Veronika Németh also Hungary! 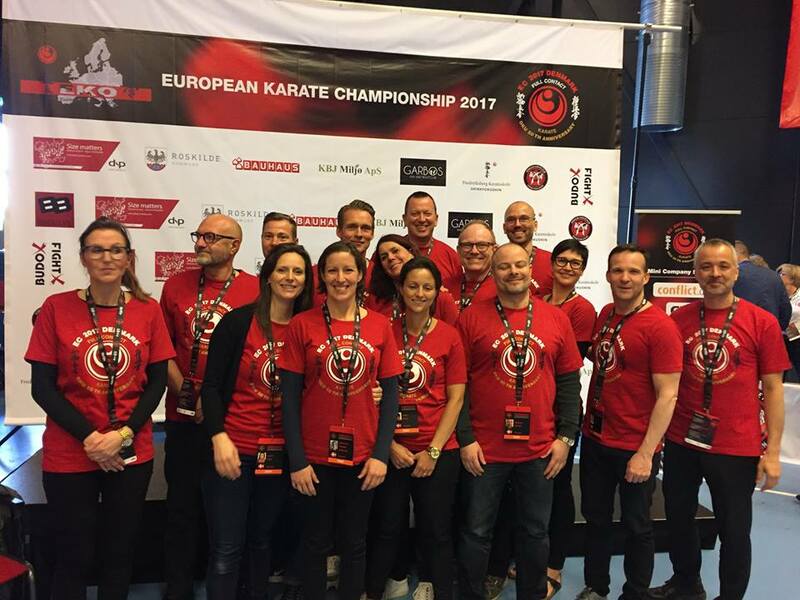 This was a really classy final, and this really showed us the whole technical aspect in full contact Karate. Even when the pace was increased, so were the NOTE THIS: techniques as sharp as before! This was really a crowdpleaser, and it was no coincidence that these met in the final. Veronika Németh climbed from third place to second 2016-17, and in a convincing way. Winning 1st fight against Salome Modebadze / Georgia, and in the second fight knocking out EC KWU champion and multiply WKO EC champion Rita Pivoriūnaitė / Lithuania. Pivoriūnaitė on her side had to struggle in her previous fight against a very good Isis Pinilla / Spain. Pivoriūnaitė was overrun by Pinilla in the ordinary round, the Spanish fighter moved well connecting with solid chest punches, and numerous strong inside leg-kicks. Pivoriūnaitė manage to pick up the pace in the extensions, and got the victory after a very hard strong fight. As a connection to the Németh vs Pivoriūnaitė fight, where the fight ended with knock out – inside lowkick, many was sure that the foundations were laid in the Pinilla fight, hitting the same spot. 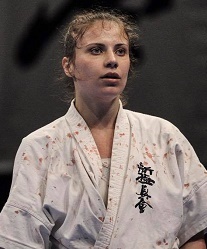 Zsófia Szabó was also impressing in the early rounds, earning a waza-ari against a agressive Anna Bielska / Poland, before she controlled Diana Mačiūtė / Lithuania. The strong Lithuanian fighter, EC Champ and several times EC top 3, could never threaten the defending champion, who on her side tormented her opponent with lowkicks and well timed punches. Zsófia Szabó was also awarded technical award. 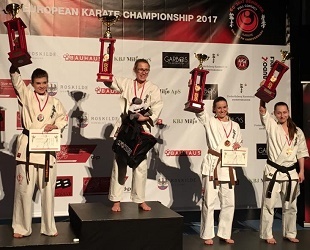 Zsófia Szabó also campeated in Kata, so did Isis Pinilla, Diana Mačiūtė, Rita Pivoriūnaitė – all very impressive fighters as we know, and top of that they got top level Kata! Middleweight under 60 kg was also a strong category, with several profiled fighters. But it was a new star raising in this category, Andreea Merca / Romania. 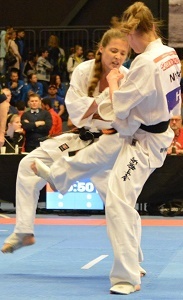 Handling EC Champion and Lithuanian top fighter Rūta Brazdžionytė. In the ordinary round the fight was quite even, Merca the strongest in pressing the fight, Technique wise much alike but the Romanian fighter landed more kicks in the exchanges, Brazdžionytė some good jodan attempt after restarting the fight. I the two next rounds Brazdžionytė grows into the fight, but Merca is the one that keeps coming forward. The last two rounds are impressive from both fighters, and when the decision are made Andreea Merca takes first place. In the end many said that Brazdžionytė was the most active one – maybe. But in that case she did not dominate more than she was being dominating self in the first extension. It could easily been taken a decision after the first extension. We think that it will be very interesting next time! On the way to the final both met some really good fighters. Brazdžionytė on her way Marta Lubos / Poland in a very hard and even fight. Lubos made it third – as she did last year, but last year it was in the division below. Merca on her side took a notable win against the last year runner upp Gabija Gudeliauskaitė / Lithuania, and a strong Ivanka Deleva / Bulgaria (ended third) in the semi final. Heavy weight + 60 kg did also have several European Champions at the line up. Home-fighter Christine Buchholtz U22 Champion, Agata Winiarska (Kaliciak) / Poland KWU EC reign Champion, Camille Haddouche / France, reign KWF EC Champion. Sara Hägge / Sweden came in third last year, and she was the only one from last year podium to reach it again. -and not only reach it, she manage to win the category! Monika Ryžkovaitė / Lithuania advanced against Agata Winiarska / Poland, in a fight that became somewhat messy and disorganized. Next fight against Aiala Garcia / Spain was no match, and the final was coming up. The final was battle of the styles, Hägge trying to sort things out in a technical way, Ryžkovaitė messing things up, wildly punches at the highest pace she can. The ordinary round are over, and there is a tie and into the extension. The fight follow the same pattern, Hägge fighting patient whit discipline, Ryžkovaitė continues in the same way she started, but all can see that the pace has began to drop. 1-4 to draw, and weight – no difference. Next round, and Hägge`s experience are quite clear, changing style, moving and attacking the legs, Ryžkovaitė do not have anything more to come up with, raises the spirit and pace in a last try to face the challenge. As the punches fly, no one are surprised when Ryžkovaitė hits to high and connect to the face. The little break works well and back in the fight, where Hägge turn up the heat for the last part, and finish with a roll-kick. 5-0 to Hägge, and the crowd explodes! She later on receive the spirit price, and it is probably the final alone that has been the main reason for that. Before the tournament we saw that some of the profiles could not fight this EC for different reasons. As mention this made room for new to step forward – and they did! This means that we have dept in our organization. Dept and width. We need both to keep the top level and develop further. The level of the fighting can always be a question, who to compare with? As we have mentioned, the last years many athletes has been competing across organizations. Up to now we believe the perfect mix of good technique and good physique has been the the winning prescription – no big bomb. But as we mention in the first write up, we clearly see two different paths. In our heads we follow Zsófia Szabó and Veronika Németh final, the perfect mix we just mention. And We also think about the heavyweight final, where we dare to say that the settlement of this issue was made. Soon the World Championship in weight categories will be held, and now Europe are put up against other part of the world. We has been on up against each other er many feelings has been trigged. But if the EC not had been so hard and so demanding, we could never compete against the stronger nation outside Europe that`s for sure. 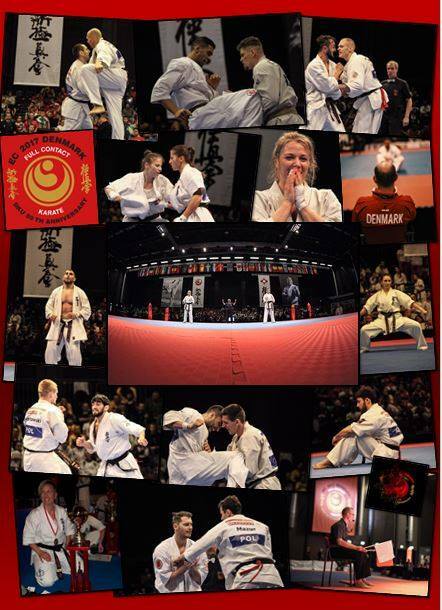 Once again this has been a great tournament from the Danish Union, we can only thank..!